Virtual Reality and Augmented Reality are amongst the most exciting technologies that are coming into its own in this very moment. For quite a long time both of them were considered to be nothing more than a flight of the science fiction author’s fantasy (excluding gaming industry), but the persistence of the dreamers made an idea more and more tangible with the passage of time. In this article, we are going to tell about the ways VR / AR technologies can improve and diversify the experience of various events. How AR / VR Event Apps Can Improve Event Planning? One of the reasons why AR / VR is so attractive for the event planners of various conferences and meetups is because of its universality and seemingly limitless potential. If you think about it, virtual and augmented realities can serve almost any purpose and neatly fit into every organizational aspect. The implementation of augmented or virtual reality solutions in the event planning & management is more of a logistical issue than technological. In other words, all it takes to effectively implement AR/VR into the mix is to have an idea of what exact features do you need for a particular event. 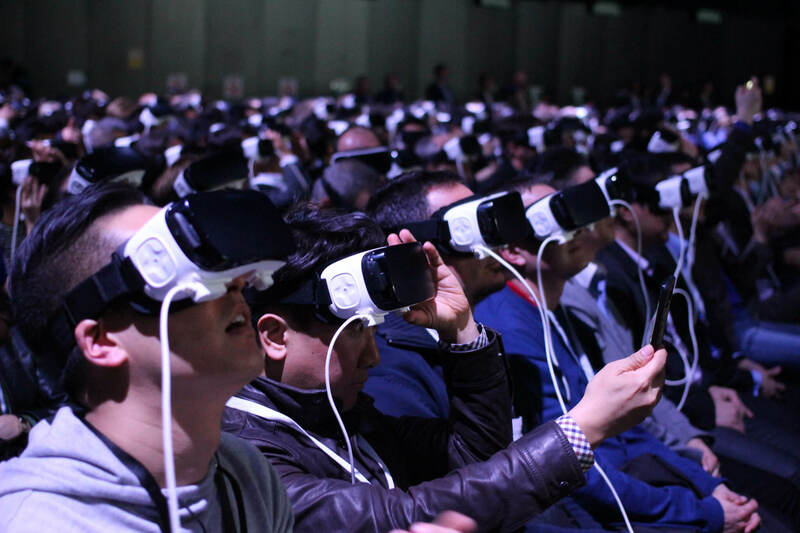 Granted, if your event takes place on a single stage and there are no additional panels elsewhere, there's no point in creating a full-blown virtual reality conference navigation feature. But at the same time, perhaps there are exhibits around that one stage, where you can provide additional information by using augmented reality. Let’s take a look at the most potent uses of VR & AR in event planning. At the moment, one of the two most common uses of augmented reality during such events as conferences and summits is visitor/participant routing and navigation assistance. Given the fact, that some of the bigger events are usually taking parts in the pavilions with labyrinthine sprawls of panels - it is easy to get disoriented and get lost even if you have a map. Enter AR. Augmented reality makes that a non-issue without much of a fuss. Such application is basically an extension for an event app and usually work within a framework of the other map service (for example, Google Maps). As such, it is both simple and convenient solution for a dubious issue. Another great way of implementing augmented reality into event planning is adding it to the most basic element of communication - business cards. Gathering information at the large-scale events can be messy and at times rather a laborious process with too much to surf through afterward. However, the main challenge is remembering the people you've talked to and connecting a face to the name. An AR solution can make it easier and much more streamlined. Here’s how: augmented reality video scenarios can be activated via tokens and you can see the person the card belongs to (and sometimes even hear). These tokens can be loaded with all sorts of information - contact information, stats, videos, photos, etc. For example, it can be a simple introduction to a person, the company he represents, the projects he is involved in, and some contact information with links and so on. A token can also contain something more sophisticated - a short self-presentation or a project pitch. Sure, it doesn’t mean that traditional communication is going anywhere, but it sure streamlines its more processual elements. In case there is more than one AR event to activate, it is important to visually distinct token so that there would be no overlap. Presentations often seem like the most natural thing to include Virtual Reality or Augmented Reality solutions, especially when it comes to presenting some kind of project that requires proofs of concept and practical demonstration of the project in action. It is also one the more exciting way of implementing the technologies into the event planning. The reason for that is simple - presentations are always the hardest parts of the event both for presenters and those to whom it is aimed at. There is always a chance of letting something very crucial to slip away in the sea of words and the whirls of slides. As such, Virtual Reality / Augmented reality presentation can be effective at showing hows, whats, and whys of the project. Such projects are easier to do because of a limited extent of interactivity. Implementation of VR & AR solution also makes the whole presentation process much more convincing, especially in cases when the project had already taken some shape. For example, if it is an architectural project - one can make a tour through the 3D model and demonstrate how the building is going to be constructed. The same thing can be used to explain in an exquisite detail the inner workings of the mechanism or an infrastructure scheme. On the other hand, virtual or augmented reality technology adds more weight to the plays a simple psychological presentation on its own is a fine sign that you really care about that particular idea and want to show as fully as possible. It is an exciting technology as it is and every time it is used drives more attention than just another presentation (except for when the whole event is dedicated to AR/VR and everyone uses it). Virtual and Augmented Reality can also be used to expand traditional presentations and supplement an additional layer of information that gives more context and uncovers various interesting details regarding various aspects of the project. Such augmented reality event presentations can contain all sorts of contents - from simple footnotes to alternative versions of the presented concept. For example, let’s take an exhibition catalog. There are lots of information regarding different projects. Usually, it is really condensed and streamlined to the bare bones due to limited space. AR can make it easier. Every entry can be turned into the fully animated presentation of an idea, leaving only the basic information on paper and channeling the rest into the ether. One of the major advantages of virtual reality technology is that it provides an interactive experience that can be used as a showcase of an idea in much fuller capacity than in the real world. However, it can also be used to enable more direct communication between the participants scattered around the globe in a form of a virtual reality meetup environment - let’s call it disembodied conferencing. Virtual Reality live events have a potential to break distance barriers and bring people together for a conversation in a more comfortable and immersive form. The reason for applying such solution is simple - event planning involves dealing with such chores as paying for an event venue, travel expenses, lodging, food, and beverages. VR & AR allows to skip these issues altogether and concentrate on the event itself albeit in a slightly transformed form. A sort of elaboration on a Second Life space where users have a rudimentary interface and basic tools to communicate and share information. And all it takes to make it work is to get your event headsets on. The potential of this concept is truly astounding as it will allow producing huge scale events completely or partially in a digital realm - just imagine Virtual Reality Trade Shows. While it may sound complicated and expensive, in reality, such an environment is slightly less complex VR video game with the basic mechanics. The main challenge comes with retaining a high level of privacy and data security and not the environment itself. In the case of AR - the whole thing is simpler on the development side of things as it will only require an interface and clear transmission in order to maintain adequate presentation. The challenge comes with the presentation itself as it will require more gear to transmit an image. What’s next for VR Events? Over the course of 50 years, VR and AR went from being considered “a thing of distant future” to an actual industry with rather diverse prospects. At the moment both VR and AR are lucrative technologies full of potential and brimming with opportunities - there are many startups eager to make their mark. At this point of time, the use of AR & VR in event organization is perceived more like an icing on the cake than a real deal, but the acceptance and understanding of the possibilities of the technologies slowly grow and that opens up many new and exciting opportunities. Got an idea for a virtual or augmented reality event app?